In Italian cuisine, a ragù is a meat-based sauce, which is commonly served over pasta. The Italian gastronomic society, l’Accademia Italiana Della Cucina, has documented 14 different ragùs. 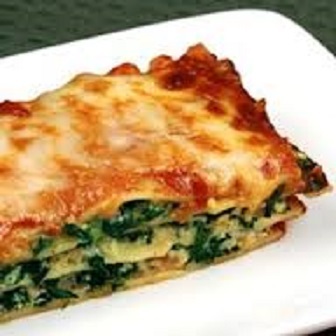 The commonalities among the recipes are that they are all meat-based and all are used as sauces for pasta. 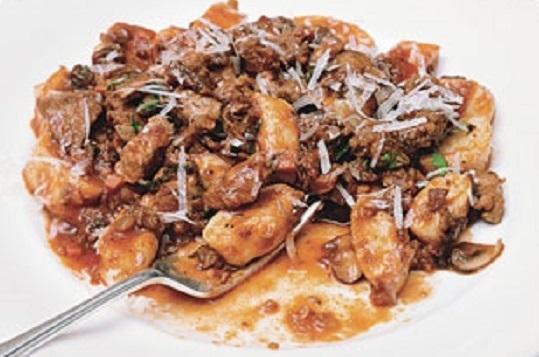 Typical Italian ragùs include ragù alla bolognese (Bolognese sauce), ragù alla napoletana (Neapolitan ragù) and ragù alla Barese (sometimes made with horse meat). In the northern Italian regions, a ragù is typically a sauce of meat, chopped or ground, and cooked with sautéed vegetables in a liquid. The meats are varied and may include beef, chicken, pork, duck, goose, lamb, mutton, veal or game, as well as offal from any of the same. The liquids can be broth, stock, water, wine, milk, cream or tomatoes and often include a combination of these. If tomatoes are included, it is usually a small amount. Characteristically, a ragù is a sauce of braised or stewed meat that may be flavored with tomato, to distinguish it from a tomato sauce that is flavored with the addition of meat. In southern Italian regions, especially Campania, ragùs are often prepared with whole cuts of beef, pork and regional sausages, cooked with vegetables and tomatoes. After a long braise (or simmer), the meats are then removed and may be served as a separate course. 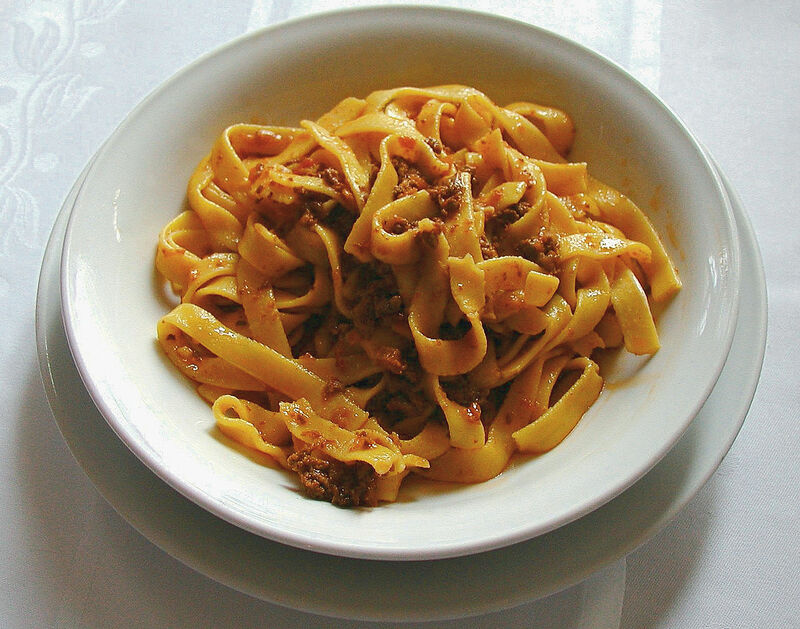 Examples of these styles of ragùs are the well-known ragù alla Napoletana (Neapolitan ragù) and carne a ragù. 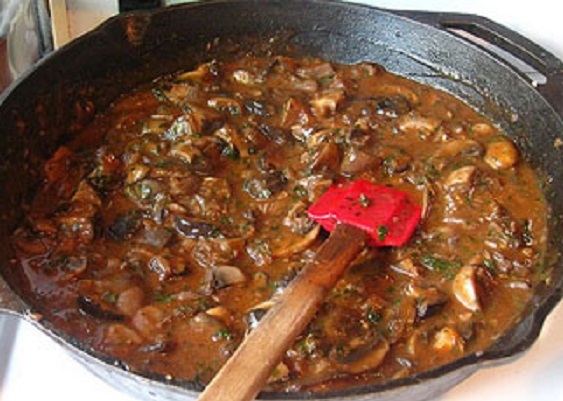 Sometimes a thick meatless, vegetable based sauce is referred to as a ragu, such as mushroom ragu. This sauce is excellent served over potato gnocchi. Trim the fat from the exterior of the pork. Cut it into bite-sized pieces, about 3/4-inch cubes, trimming more fat and bits of cartilage as you divide the meat. Pat the pieces dry with paper towels. Pour the olive oil into a large pan, set it over medium heat and add the pork. Spread out the pieces in the pan and season with the salt. Cook the pork slowly for 15 minutes or so, turning to brown the pieces on all sides. When the pork is brown, add the chopped garlic and chili flakes. Raise the heat and pour in the white wine, stir and bring to a boil. Add the crushed tomatoes and 1 cup of water; grate the fresh nutmeg over all and stir. Cover the pan and bring the sauce to a boil, then adjust the heat to maintain a steady simmer. Cook for about 1 1/2 hours or until the pork is tender and the sauce has thickened. If the liquid is still thin toward the end of the cooking time, set the cover ajar and raise the heat a bit to reduce it. Use immediately or cool and refrigerate until needed. This sauce is excellent for pasta, baked in a lasagna or poured over polenta, cooked into risotto or as a condiment for grilled steak or fish. Squeeze out the soaked porcini and slice them into pieces about 1/4-inch wide. Strain the soaking water and set aside. Tie all the fresh herb sprigs together with piece of kitchen twine. Put the oil and butter in the large skillet or saucepan and place over medium heat. When the butter melts, add the onions and shallots and 1/4 teaspoon of salt and stir well. Cook slowly for 6 minutes-stirring often-until they’re soft, wilted and shiny, without any brown color. Add the fresh mushrooms and porcini to the pan and sprinkle with 1/4 teaspoon salt. Add the herb bouquet, raise the heat a little and cover the pan. Cook, covered for about 3 minutes, so the mushrooms release their liquid. Uncover and continue to cook over fairly high heat, stirring frequently, until the mushrooms shrink and the liquid evaporates, 5 minutes or more. When the pan is dry and the mushrooms begin to brown, clear a spot, add the tomato paste and stirring,cook for a minute or so, then stir it into the mushrooms. Pour in the Marsala and stir constantly until the wine evaporates. Add the porcini mushroom water and 2 cups of the hot stock. Bring to a boil, stirring up any caramelization in the pan. Lower the heat to keep the sauce bubbling gently and cover the pan. Cook for about 20 minutes, occasionally stirring and adding stock to keep the mushrooms covered in liquid; expect to add at least a 1/2 cup, if not more. Uncover the pan and cook for another 20 minutes, maintaining a simmer and adding stock as needed. Remove the herb bouquet and discard it. Taste and add salt, if needed, and freshly ground black pepper to taste. Season the pork all over with 1 teaspoon salt and pepper to taste. In a food processor, chop together the parsley, onions, garlic, pancetta and prosciutto to make a very coarse paste. Heat the olive oil in a Dutch oven over medium-low heat. Add the seasoning paste and another teaspoon of salt and cook until no more liquid appears when the paste is stirred, about 7 minutes. Add the pork roast, cover and reduce the heat to low. Cook, turning every 15 minutes, until the meat is lightly browned and the onions have begun to color, about 1 hour. Add the red wine, place the cover back but leave ajar and continue cooking until the wine reduces to a thick sauce, about 1 hour, stirring occasionally. If, after 1 hour and 15 minutes, the wine has not reduced sufficiently, remove the roast to a plate, increase the heat to medium-high and cook the sauce until it thickens. Reduce to low heat, stir in the tomato paste, 2 or 3 tablespoons at a time, stirring in each addition until it mixes into the sauce and darkens to a brick color. Stir in the crushed tomatoes, return the roast to the pan if previously removed and cover. Continue to cook, turning the meat every 30 minutes and stirring the sauce until the meat is tender enough to be easily pierced with a meat fork, 2 to 2 1/2 hours. If the sauce dries out too much and the meat begins to stick to the bottom of the pan, stir in a tablespoon or two of water. Put the olive oil in a large skillet over medium heat. Add shallots, garlic and pepper flakes and cook for about 1 minute; add the white wine and cook for a few minutes. Add the tomatoes and squash and season with salt and pepper. When the squash is tender, about 20 minutes or so for small cubes. Remove the pot from the heat and mash the sauce with a potato masher. Stir in the mascarpone cheese, if using. Keep warm while the pasta cooks. Bring a large pot of salted water to a boil and cook the pasta until it is al dente. 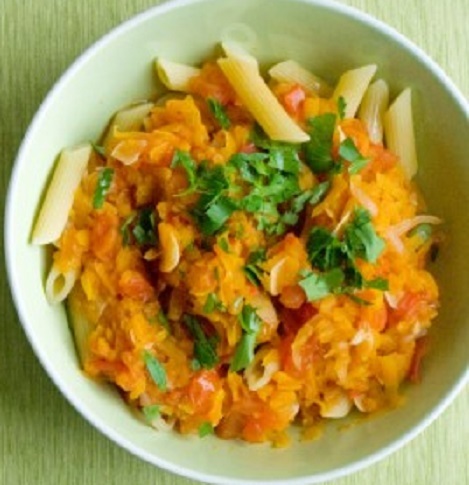 Mix the sauce and pasta together and serve garnished with parsley or Parmesan cheese. If fresh basil is not available in your market this time of year, substitute with fresh flat leafed parsley and 1 tablespoon dried basil. Place the cherry tomatoes in a food processor and process until finely chopped; pour tomatoes into a fine strainer and drain off excess juices. Return the pulp to the processor. Process the tomato pulp along with the almonds, basil, Parmesan, olive oil, raisins, capers, chili flakes, anchovies, garlic and pepperoncini in a food processor until finely ground. Bring a large pot of salted water to a boil over high heat, add pasta and cook, stirring, until al dente. Drain, reserving ¼ cup cooking water, and transfer pasta to a large bowl along with the pesto; toss to combine, adding a couple of spoonfuls of pasta cooking water, if needed, to create a smooth sauce. Transfer to a large serving platter or individual bowls and serve with more Parmesan cheese. Pasta comes in many shapes and lengths and there are hundreds of combinations of pastas and sauces. These pairings may seem random, but to Italians, there’s a surprisingly logical process that goes into choosing the perfect pasta shape for a given sauce. You would not want to pair a chunky sauce with thin noodles because the sauce will separate from the noodles and wind up in the bottom of the bowl. 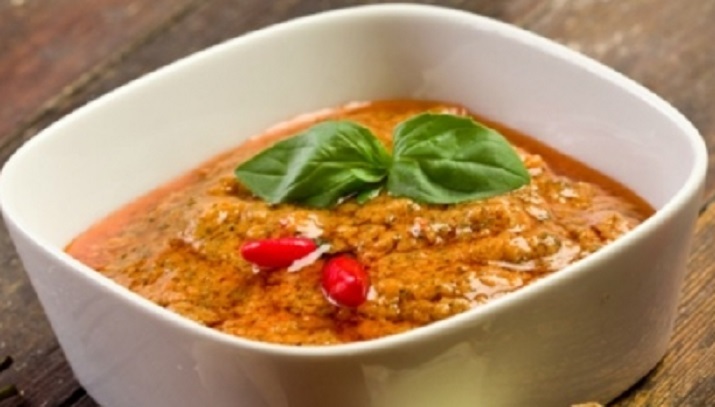 Meat sauces or other chunky sauces are best with larger hollow tubes such as rigatoni and penne, or in the cupped shape of conchiglie (shells). 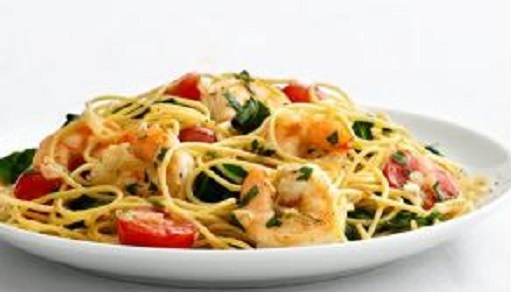 Spaghettini, thin spaghetti, is usually the best vehicle for an olive oil based seafood sauce. Many tomato sauces work better with thicker, hollow strands known as bucatini or perciatelli. Fusilli is excellent with a dense, creamy sauce, that clings to all its twists and curls. Here are some well-matched pasta and sauce recipes for you to try. Heat olive oil in a Dutch oven over medium-high heat. Add onion, 1/4 teaspoon salt, 1/4 teaspoon pepper and beef; cook 10 minutes or until the beef is browned, stirring to crumble beef. Add eggplant, garlic, 1/4 teaspoon salt and remaining 1/4 teaspoon pepper; cook 20 minutes or until eggplant is very tender, stirring occasionally. Add tomato paste; cook 2 minutes, stirring constantly. Add wine; cook 1 minute, scraping pan to loosen browned bits. Add tomatoes; bring to a boil. Reduce heat; simmer 10 minutes, stirring occasionally. Cook pasta according to package directions, adding kosher salt to the cooking water. Drain. 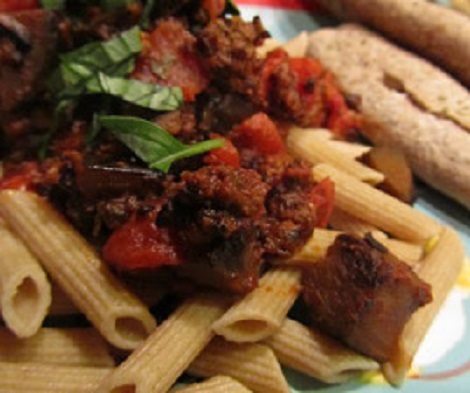 Toss pasta with the eggplant sauce; sprinkle with basil leaves. Bring a large pot of water to a boil over high heat. Add the fettuccine and cook for 6 minutes, stirring often. 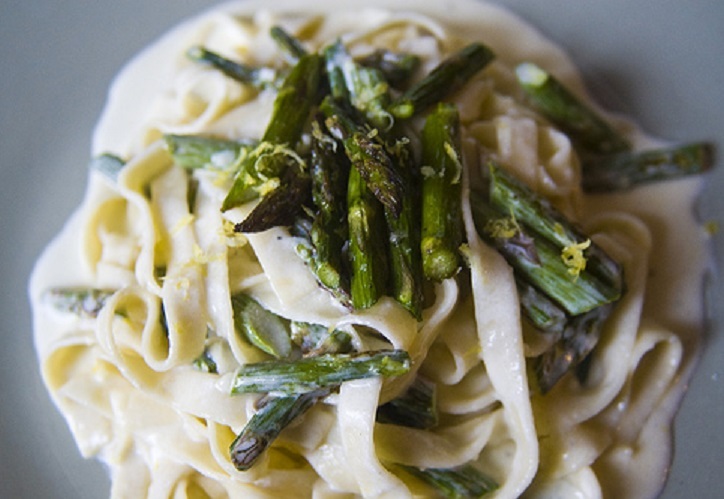 Stir in the asparagus, and cook 4 to 6 minutes more, or until the fettuccine is al dente and asparagus crisp-tender. Scoop out 1/2 cup pasta-cooking water and reserve. Drain the pasta and asparagus and return to the cooking pot; cover to keep warm. Combine milk and flour, whisking until smooth. Meanwhile, in a medium nonstick saucepan over medium heat oil and garlic and cook, stirring, 30 seconds, or until fragrant. Gradually add the milk, whisking constantly. Bring to a boil. Reduce the heat and simmer, stirring often, about 5 minutes, or until thickened and smooth. Remove from the heat. Whisk in the cream cheese and Fontina until smooth and blended. Season to taste with salt and pepper. 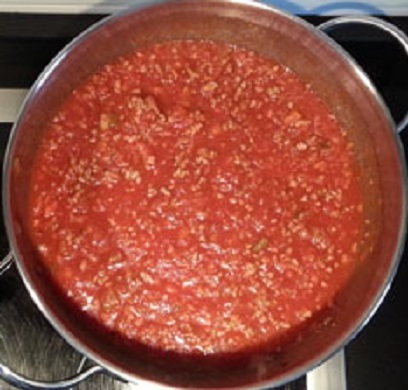 Add the sauce to the pasta and toss, adding pasta water to moisten, if necessary. Sprinkle with the walnuts. Heat olive oil in a skillet. Add garlic and pepper flakes to the skillet. Add the cherry tomatoes and basil. (Add shrimp, if using.) Simmer for five minutes. Season with salt. Cook the pasta according to package directions. Drain and toss with the sauce. Garnish with freshly grated Pecorino Romano. Preheat oven to 350°F. Cook noodles according to package directions. Drain noodles and lay out on clean kitchen towels. In a large bowl stir together ricotta cheese, egg, 1 1/2 cups mozzarella cheese, Italian seasoning, garlic powder, and black pepper; set aside. Coat a nonstick skillet with cooking spray, add 1 tablespoon water (or wine) and sauté mushrooms and onion over medium heat 5–6 minutes, or until onion is tender. Stir in spinach and set aside. Coat an 11″ x 7″ baking dish with cooking spray. Layer 3 noodles, half of the cheese mixture, half of the spinach mixture and 1/3 of pasta sauce. Repeat layers. Top with remaining 3 noodles and remaining pasta sauce. Bake uncovered for 30 minutes. Sprinkle with remaining 1/2 cup mozzarella and bake for 5 minutes more, or until cheese melts. Let stand 10 minutes before cutting. Heat 1 tablespoon oil in a small skillet over medium-high heat. Sauté onion, stirring often, until softened, about 4 minutes. Add garlic and cook, stirring frequently, about 1 minute. Transfer mixture to a bowl and set aside. Mix the sun-dried tomatoes and plum tomatoes with the onion mixture. Add oregano and pepper flakes to taste. 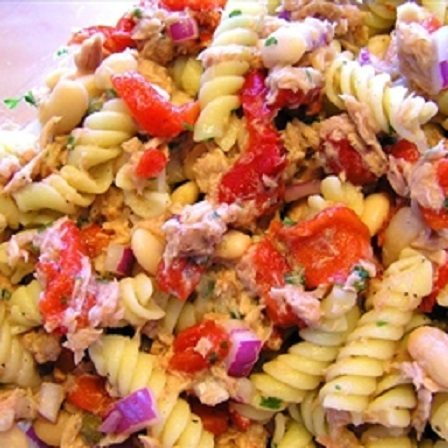 Add beans, tuna and capers to the skillet and cook, breaking up tuna, until the mixture is completely heated through. Mix in the tomatoes and the onion/garlic mixture. Cook, stirring often, until completely heated through. Add cooked pasta and heat through, tossing to mix well. Season to taste with salt and pepper. Serve garnished with parsley.